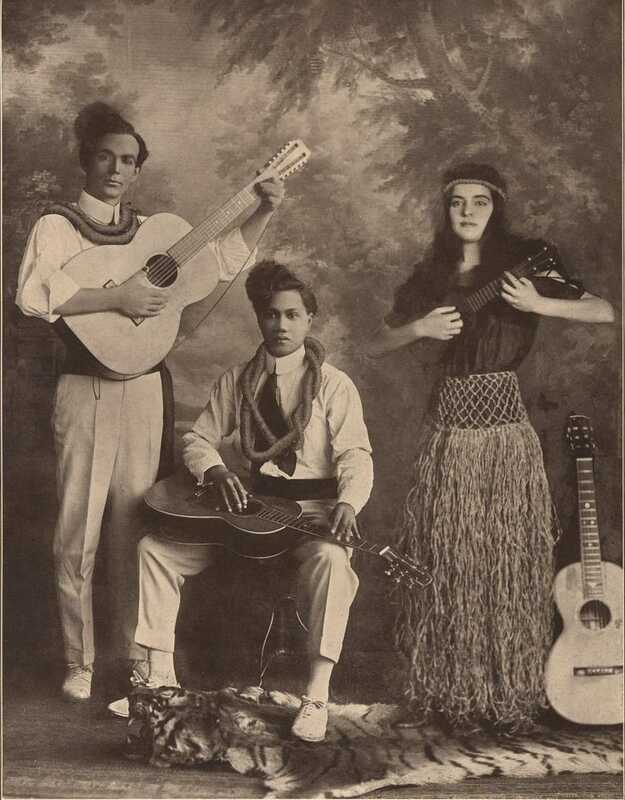 The Bird of Paradise play is so successful that it travels internationally for eight years, from 1919-1927, with Joseph Kekuku featured as the steel guitarist in the Hawaiian musical ensemble. 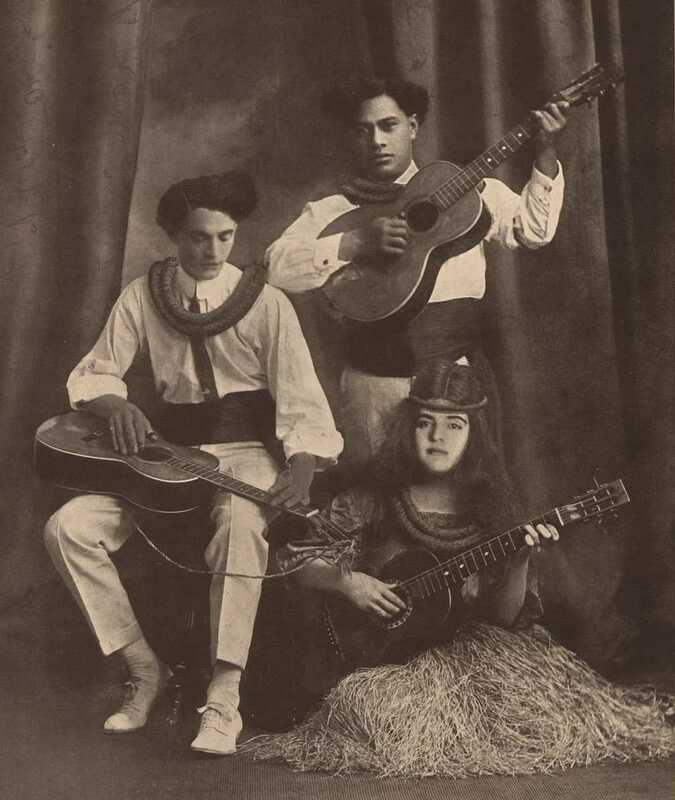 The Royal Hawaiian Troubadors, 1919. 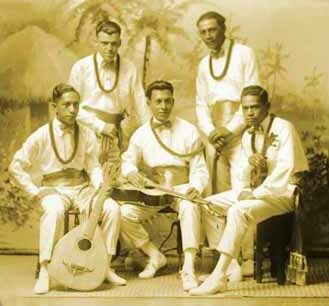 Many groups, both native Hawaiian and mainland "Haole", spring up on the lyceum (Chatauqua) music circuits. Some are more convincing than others. 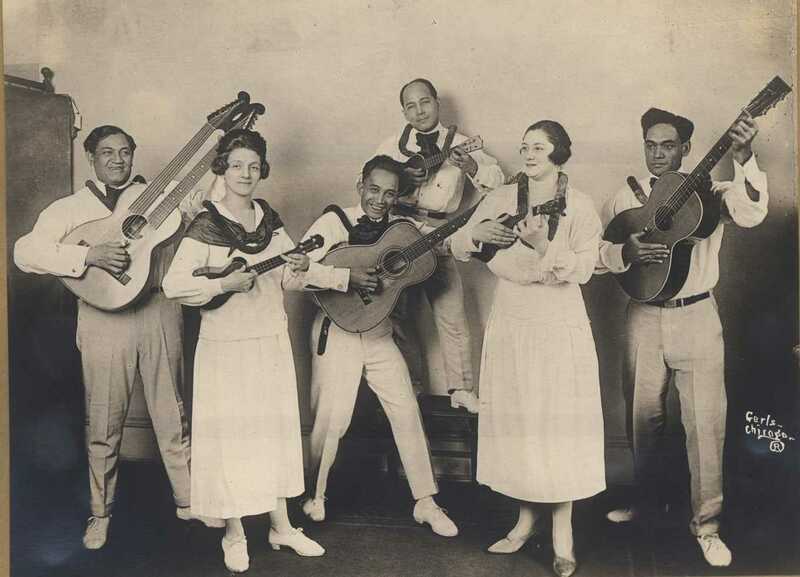 The Golden Gate Concert Company. Guitarist with The Golden Gate Concert Company. 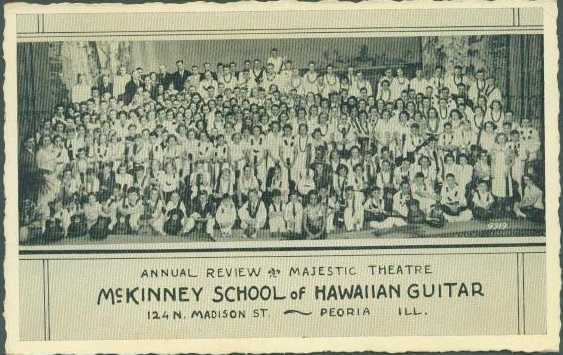 Additionally, schools spring up which promote the sale of Hawaiian guitars, Hawaiian sheet music, and Hawaiian guitar instruction. 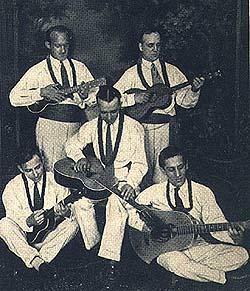 Hawaiian "orchestras" of aspiring players become popular, as did mandolin orchestras before them. The Martin style 18 is now a steel string instrument. Frank Ferera makes several Edison recordings with Vernon Dalhart joining on vocal refrain. One song helps popularize "hillbilly" music: Frank Ferera accompanies Vernon Dalhart as he sings and plays harmonica on The Wreck On The Southern Old 97. The Martin style 28 is now a steel string instrument. 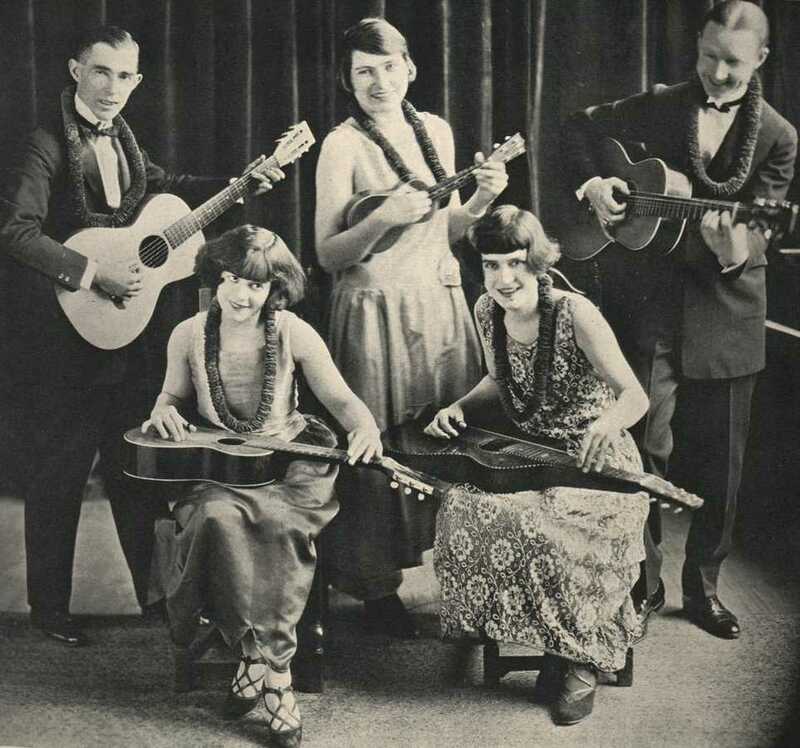 Structural changes become necessary to accommodate the tension of steel strings, including the addition of an Ebony neck bar reinforcement in the mid 1920s. 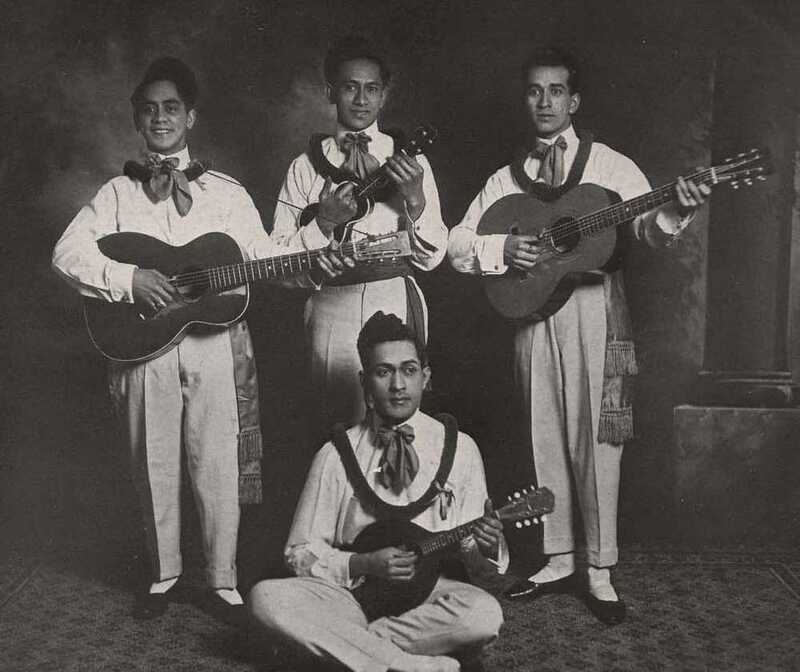 Hawaiian guitars continue to suffer from lack of volume in ensemble playing since the soundhole faces up instead of out. 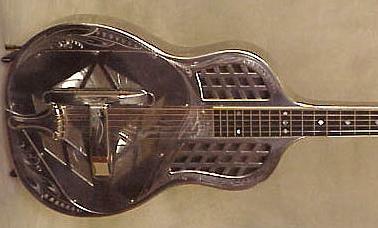 In response, several companies produce wood- or metal-bodied resonator ("ampliphonic") acoustic steel guitars, played primarily with a slide. 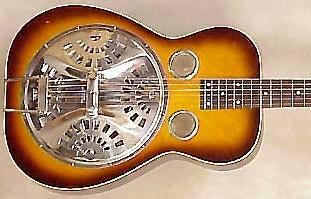 These "Dobro" or "National" guitars provide more volume, sustained tone, greater vibrato, and glissando. 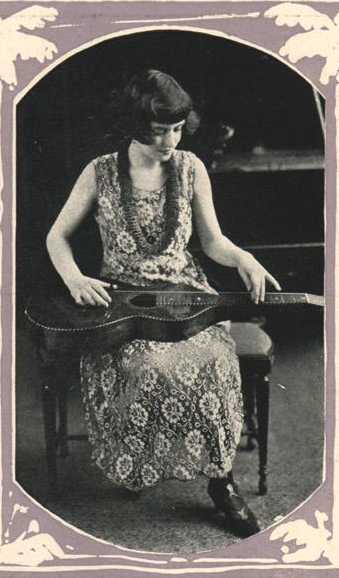 Unknown performer playing a resophonic guitar. 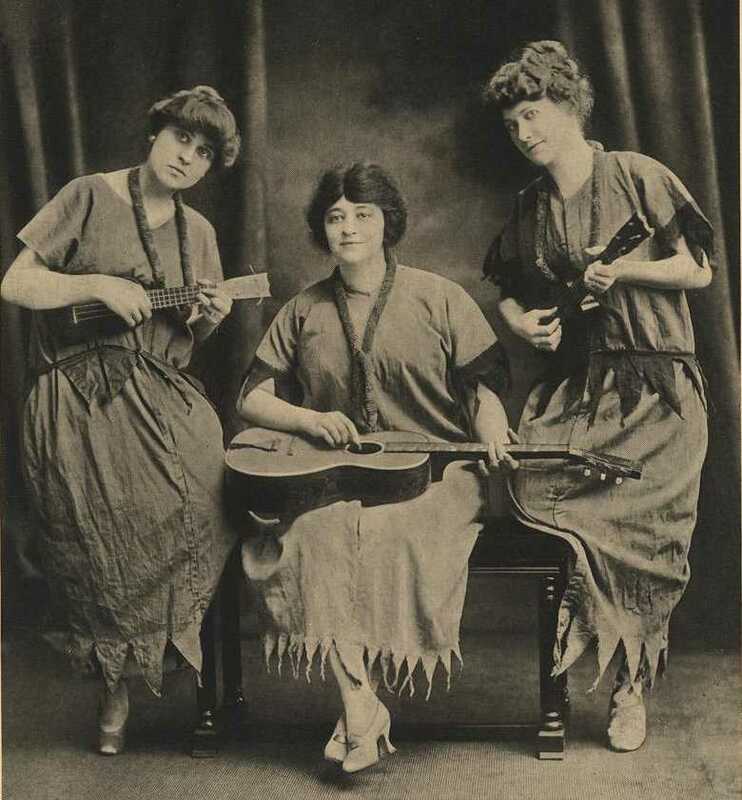 The Carter Family and "The Singing Brakeman", ex-railroad worker Jimmie Rodgers, cut the first country music records in Bristol, Tennessee. 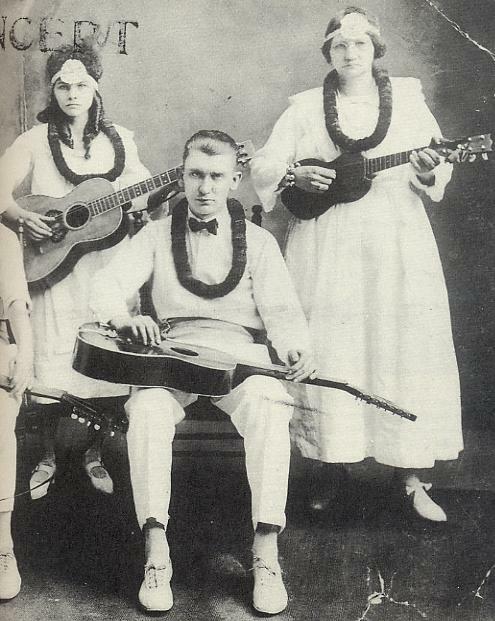 Both Jimmie Rodgers and Maybelle Carter of the Carter family play Hawaiian slide guitar on various songs as part of their touring acts. 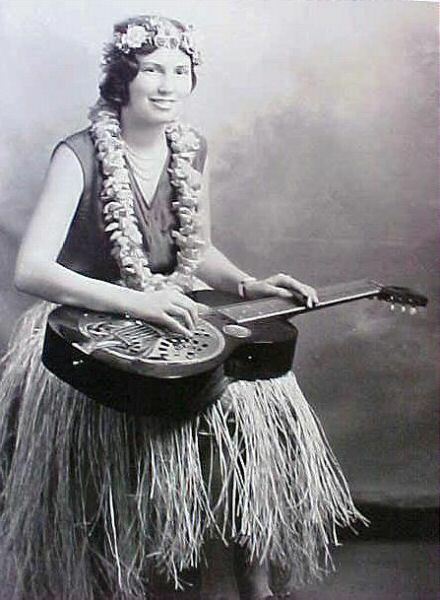 Maybelle Carter began playing Hawaiian steel after hearing a recording of Frank Ferera accompanying Vernon Dalhart on The Wreck On The Southern Old 97. To quote George Kanahele, "The American musicians most influenced by the steel guitar were the country musicians". 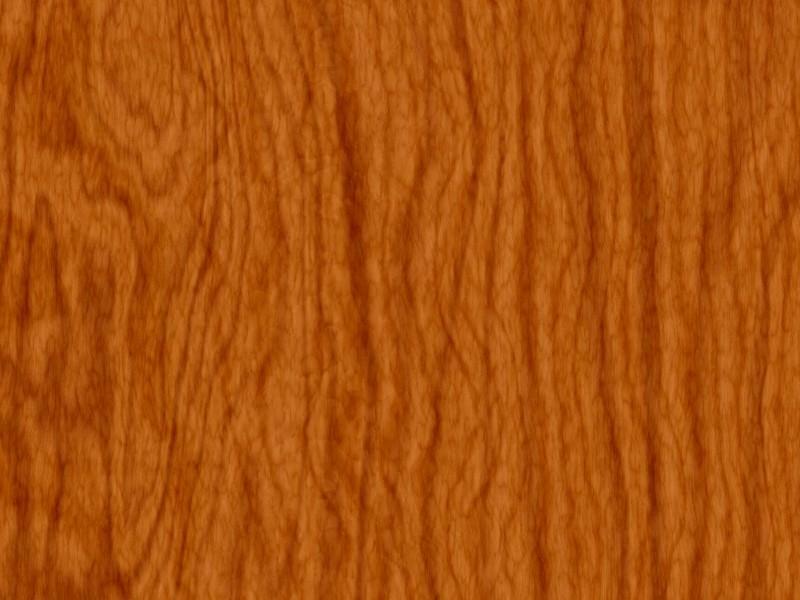 By 1928, the entire line of Martin guitars is steel string, thus concluding a complete transformation of the company as well as thoroughly, and irrevocably altering the future of the flat-top guitar in America. Martin switches all of its guitars to a "belly" bridge to counteract the increased tension of steel strings.